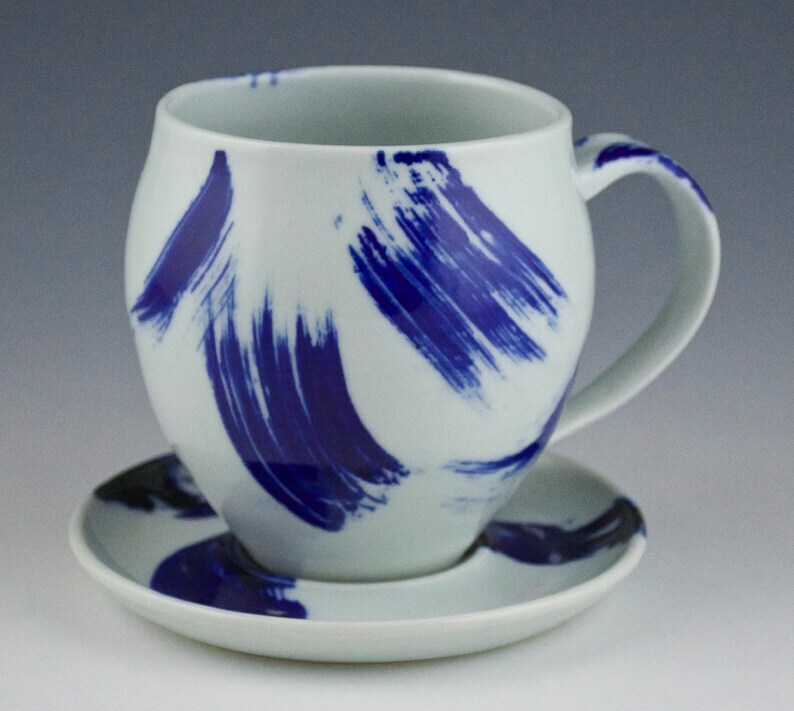 This wheel thrown porcelain tea cup and saucer are perfect for your favorite hot drink. They are glazed in a free form blue design against a white background. Please keep in mind that pottery is handmade and will have natural variations that make it unique. All of my ceramics are food, dishwasher, and microwave safe. very nice and well made berry bowl. Super speedy shipment. Thank you very much! Great quality and excellent and prompt shipment! What a pleasure to work with. Purchased one and went back for 2 more. PurelyPottery accepts PayPal and credit card payments through Etsy direct checkout. Payment must be made in full and have cleared before items are shipped. If you purchase something and change your mind before paying please let me know, and I will cancel the transaction. Returns and exchanges are accepted within 7 days of receipt of your pottery. Shipping charges are not refundable. The buyer is responsible for return shipping fees. A refund or exchange will be issued upon the SAFE return of the items. Custom orders are not returnable. Items are shipped via USPS or UPS depending on zone and will ship within 1-3 business days of receiving payment. If you need an item to be sent Priority Mail, please contact me to find out if an additional fee will apply.